When the Easter egg hunt comes around, reusable tin buckets are a great way to carry the treasure trove. 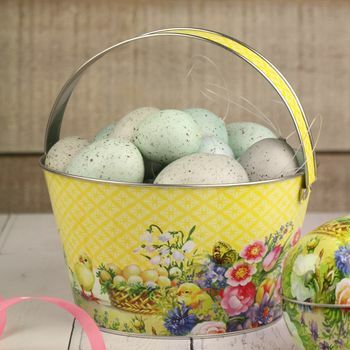 This Easter bucket one is beautifully illustrated with chicks, eggs and spring flowers, all on a patterned background of pale yellow. You could also use this great bucket in the house to hold spring plants or as a table centrepiece containing Easter treats. And long after Easter has come and gone, it's sturdy enough to sit on a shelf somewhere holding gardening or kitchen bits and bobs.